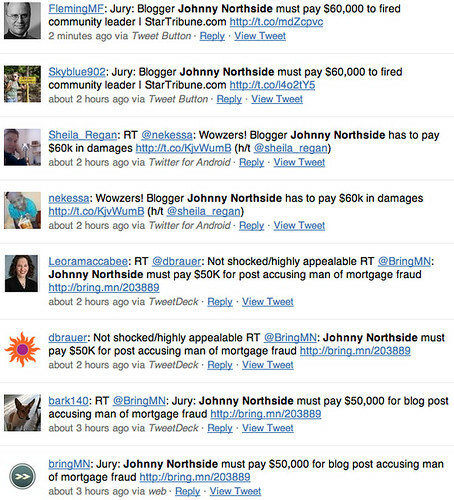 I’ll create a round-up of stories about the Jerry Moore v. John Hoff (Johnny Northside) trial’s conclusion below. Sheila Regan at TC Daily Planet: “Jury says Hoff didn’t lie, but has to pay anyway“. Sheila also has a piece after da2 of the trial titled “Who’s lying? Moore vs. Hoff, Day 2. Now we know that the jury agreed with Hoff’s truth. Kevin Giles has a column in the Star Tribune that references the case. “In social media, why let the facts get in the way?” Giles’ column is rather weak, since it suggests that Hoff lied about Moore, which is not what the jury decided in the case. If you see more pop up, let me know and I’ll add them here. I can NOT believe this outcome. It is BS and NOT right by any stretch. Those poverty pimps and chimos are probably having a party as we speak. I sure hope JNS wins in the end. I love boathead and his comments about Mr. Spanky. Thanks to you Mr. Deet also. You do a fine job. This result is absolutely wrong, in fact unconstitutional. Creating liability for speaking the truth about someone cannot create liability under these circumstances. I am without a care in the world, knowing I have great and dedicated legal help and the weight of the law and First Amendment overwhelmingly on my side. The attention of the nation is becoming focused on this case. But what was the case about? My public statement about Jerry Moore’s involvement with the fraudulent mortgage at 1564 Hillside Ave. N.
For FIVE DAYS a jury sat in judgment of the truth or falsehood of a single sentence. The jury said: NO. Not defamation. The truth. Moore was involved in the fraudulent mortgage at 1564 Hillside Ave. N.
Yes, I’m glad people are focused on the constitutional issues. But I want to know: how are we going to get to the bottom of the fraud at 1564 Hillside Ave. N. and make sure all the “little fish” who got a cut are prosecuted to the fullest extent of the law? This case stands as an example of a terrible flaw in the criminal justice system: the big fish go down, but the little fish go free. The state of Minnesota has not given enough resources to the prosecutors in Hennepin County to prosecute all the fraudsters. So…? Where does one go from THERE? thanks to my neighbor for sending me this link! Once again a jury shows that it doesn’t understand libel law. I would think Jerry Moore is a public figure, did I miss something? I hope John Hoff is going to be appealing this ruling. Makes no damned sense. Thanks veg*nation. I added that to the list along with a few others. Previous Previous post: Do I Write About Don Allen for the Money?